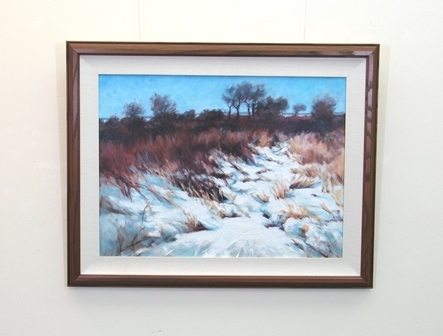 Original Oil Paintings by Artist Suzanne Poursine Massion - "Frozen Sanctuary"
Winner Merit Award in "Winter Wonderland"
Why sanctuary? Because I know that beneath this snowy landscape many creatures rest safely in burrows for their long winter's sleep. The grasses and shrubs offer others cover to escape from hungry predators. 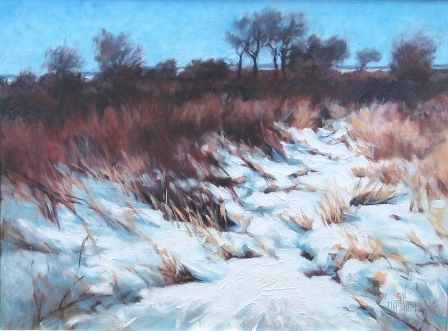 It is a cold but comforting scene that I have often been drawn to paint. This painting is framed as shown in a medium brown 1 1/2" molding with Belgian Oyster linen spacers in a stacked presentation.